Pilates is a body-conditioning method developed by Joseph H. Pilates in the 1920s that transcends all boundaries, bringing improved mind and body health to the masses. His main goal was to strengthen the “powerhouse”—the oft ignored area between the bottom of the rib cage and the line across your hips—while flattening the stomach, firming the buttocks, and correcting a weak, painful lower back. The deeper core abdominal and back muscles associated with the powerhouse support the spine, internal organs and posture. What does this mean for you? Pilates will improve your flexibility, strength, balance, muscle control and tone. You’ll become more aware of your body, posture and alignment, not only while you exercise, but during daily activities. This leads to a strong body with increased resilience to aging’s debilitating effects; this method is also considered to be an effective form of post-accident rehabilitation exercise, and is fundamental to injury prevention. Originally known as Contrology—the mind’s control over the body—Joseph Pilates had the right idea. Whether you’re young, old, injured, pregnant, overweight, or perfectly healthy and seeking a state of completely balanced mental and physical fitness, Pilates can be for you. This is a no-stress, no-impact way to accomplish your goals without strain to the heart or internal organs. Precision, not repetition or weight, is always stressed. Adding bulk is not the goal; the development of long, lean, defined muscles with increased strength is the reward. Pilates works you from the inside out; its founder planned it that way. “Developing minor muscles naturally helps to strengthen major muscles…when all of your muscles are properly developed you will perform your work with a minimum of effort and a maximum of pleasure,” Joseph Pilates reasoned. After growing up in Germany as a sick child suffering from asthma, rickets and rheumatic fever, Joseph Pilates dedicated his entire life to becoming physically stronger. He later became an accomplished bodybuilder, skier, gymnast, diver and martial artist. 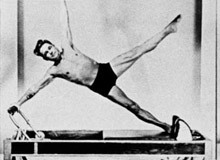 While interned in England during World War I for his German citizenship, Joseph Pilates began creating his 500-plus exercises. He became a nurse, and it was during this time that he designed the earliest version of his equipment for immobilized soldiers by attaching springs to hospital beds. The exercises were finetuned by teaching the German Army and Hamsburg’s police force prior to an immigration to the United States in the mid-1920s. 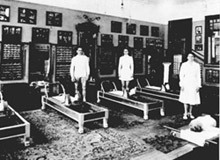 Joseph Pilates and his wife, Clara, opened a studio in New York City, attracting professional dancers, including Martha Graham and George Balanchine, and many professional athletes. These two segments were drawn to the method for its flexibility, muscle strengthening and quick rehabilitative qualities, as well as the elongation and fine toning of muscles which particularly appealed to dancers.